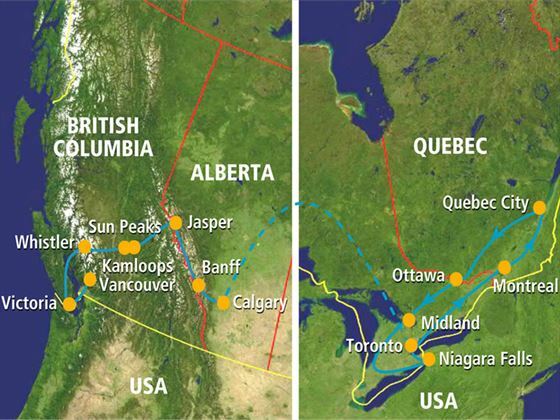 Experience the natural wonders of Canada from East to West. You'll see spectacular scenery at every turn, from rolling hillsides and ranchlands to rugged mountain ranges and national parks. You’ll travel past glaciers which have survived for centuries, majestic Niagara Falls and the wildlife of Ontario and British Columbia. This tour also includes visits to some of the most popular cities in Canada, such as historic Quebec City, sophisticated Montreal, cosmopolitan Toronto and vibrant Vancouver. Arrive at Pearson International Airport then transfer independently to your centrally-located hotel. After checking in with your Tour Director, explore at leisure for the remainder of the day. 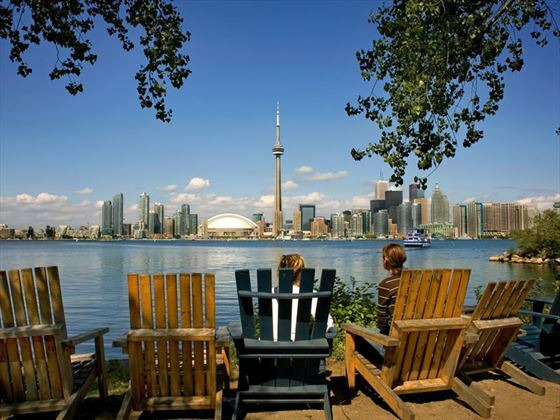 Meet with your travel companions over breakfast before taking a city tour of Toronto. Highlights of this tour will include the Eaton Centre, old and new City Halls, Yorkville and the University of Toronto. You’ll pass the Rogers Centre (formerly the SkyDome) and the CN Tower before taking a drive along the harbourfront for a complete view of the city. The rest of the day you can explore independently. Depart early today for a pleasant drive east as you follow the north shore of Lake Ontario, passing seemingly endless stretches of rolling farmland. The first destination is the Thousand Islands resort region where you’ll embark on a relaxing cruise through this stunning area. Afterwards, re-board the coach for the drive to Montreal. This morning, tour the second-largest French-speaking city in the world – Montreal. Seamlessly fusing old and new, this is a unique destination that encapsulates the two founding cultures of Canada. Take a tour of the downtown area and view the Olympic Complex, Old Montreal, McGill University, Mount Royal and the shopping streets. The afternoon is at leisure, and then there is an optional dining excursion in the evening to see ‘Montreal by night’ with a scenic trip to one of the city’s most popular restaurants. In the morning, prepare to depart from Montreal and follow the route of Canada’s first carriageway, the Chemin du Roy, into French Canada. Pass typically French-Canadian villages and towns as you find yourself completely immersed in French culture. 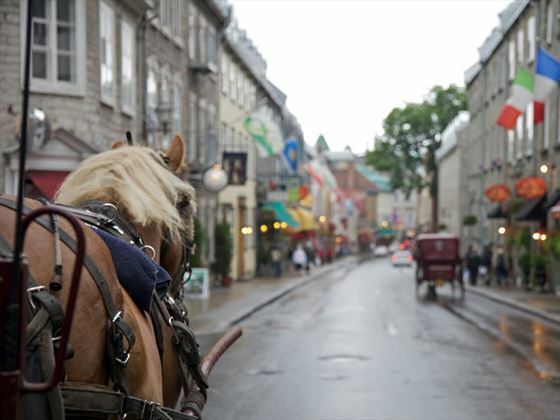 Once you’ve arrived into Quebec City you’ll be taken on a tour within the walls of the old city for views of Lower Town, the Citadel, the ornate city gates and Battlefields Park. Today is yours to spend at leisure and to further explore the sights of this charming city. You can enjoy an optional full day excursion to Tadoussac which includes three hours of whale-watching on the St. Lawrence River at the mouth of the Saguenay River on board a regular boat. You’ll also visit the spectacular Montmorency Falls which are 30 metres higher than the renowned Niagara Falls! The rest of the day is yours to spend on your own, exploring the narrow streets and unique shops. Journeying along the shores of the St. Lawrence, you’ll travel west past Montreal this morning and across the Ontario border to Ottawa – the nation’s capital. You will stop for lunch along the way at the Sucrerie de la Montagne which is an authentic sugar shack and pioneer-style restaurant. 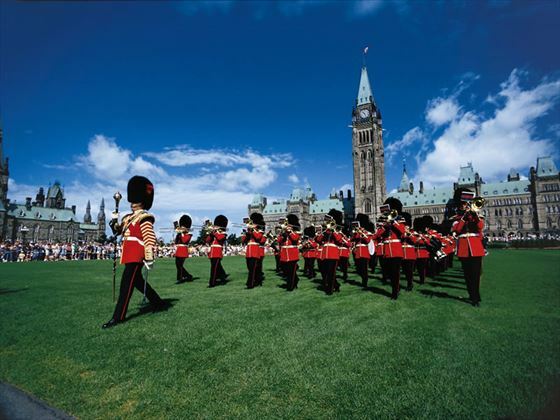 Once you’ve arrived into Ottawa you will embark on a city tour, viewing the Parliament Buildings, Rideau Canal (a designated World Heritage Site) and much more; the remainder of the day is at leisure. Enjoy the Turtle Island aboriginal experience breakfast on Victoria Island this morning, then explore on your own in the afternoon. Ottawa has many fine galleries, museums and shops, making it a great place to wander and explore. Heading west from Ottawa sees you meet with sparkling lakes, dense forests and picturesque northern towns, with the trip highlighted by a visit to Algonquin Provincial Park where you’ll take a walk along the scenic trails. This is a great destination for camping in the summer and the immense wildlife is worth keeping an eye out for. Afterwards, enjoy the beauty of the Muskoka region as you pass through on your way to Midland. This morning, after arriving at Sainte-Marie among the Hurons, you’ll have breakfast and enjoy browsing this fascinating three-acre historic site. 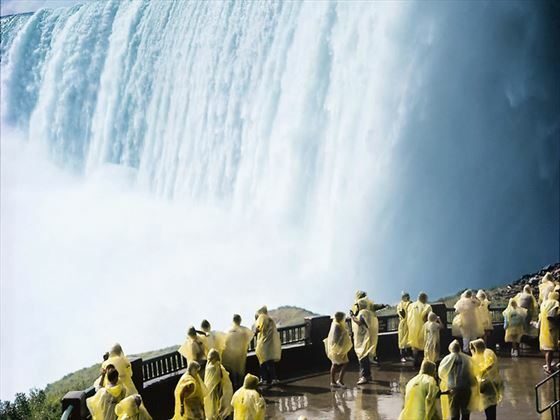 Afterwards, drive south past Toronto and through the vineyards and orchards of the Niagara Peninsula to reach the majestic falls. A boat trip on the renowned Maid of the Mist takes you to the foot of the falls – an unforgettable experience. 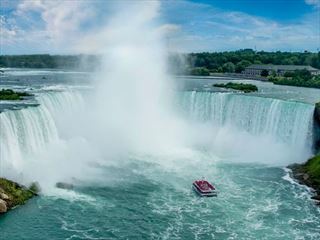 You’ll also take a ride to the top of the Skylon Tower for amazing views of Niagara Falls and the surrounding area; afterwards, you can enjoy an optional Niagara Helicopter Tour. 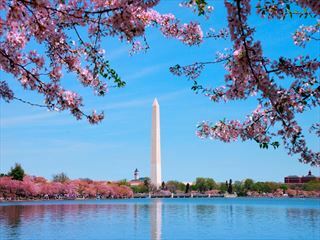 The evening is free to explore North America’s ‘Honeymoon Capital’ at leisure. Follow the scenic Niagara Parkway through the historic village of Niagara-on-the-Lake today, where you’ll be immersed in the quaint charm of this 19th century town. This afternoon completes the last segment of the eastern portion of the tour, with a short drive back to Toronto. 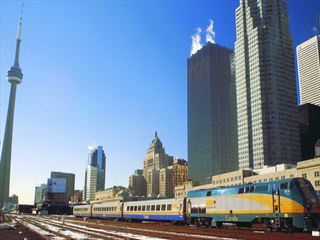 There will be a ‘Farewell to Eastern Canada’ dinner at the CN Tower in the evening. Transfer to Pearson International Airport today for your flight to Calgary in Alberta. After crossing the two thousand kilometres of rugged wilderness and wheatlands, you’ll arrive in Calgary and transfer to your hotel. 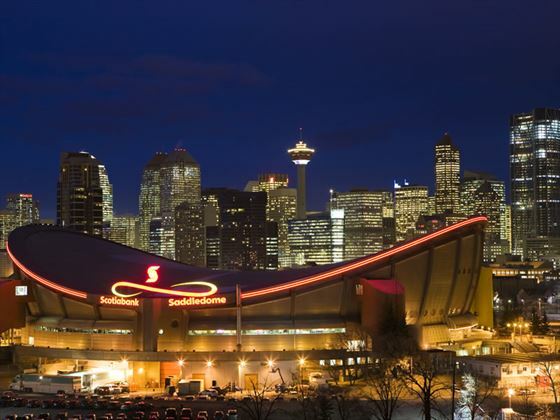 Beginning the day with a city tour of Calgary, you’ll leave the city and travel west on the Trans-Canada Highway into the foothills of the Rocky Mountains. You’ll soon reach the charming resort town of Banff, your base for the next few days. 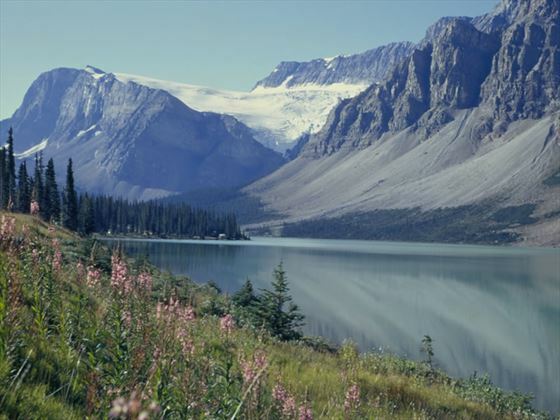 Tour the region of Banff today, which became Canada’s first national park in 1885 to protect the natural hot springs here. There is an optional Helicopter Sightseeing Tour which will give you the chance to see the eastern ranges of the Rocky Mountains; you can also take part in a gondola ride to Sulphur Mountain. Spend the rest of the day exploring the surroundings of Banff at leisure. 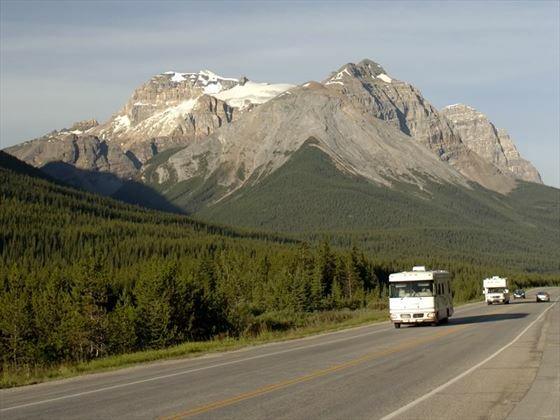 Journey through Banff and Jasper National Parks today which promises to be the highlight of the whole tour! Shortly after leaving Banff you’ll visit the famous scenery of Lake Louise, which is one of the most photographed lakes in Canada. Afterwards you’ll travel north through rugged wilderness which is edged by jagged mountain ranges. Once you’ve reached the Columbia Icefield, you’ll set aboard the Ice Explorer to ride on the surface of the ancient Athabasca River. Close to Jasper, you will also have the chance to go on an optional raft trip on the Athabasca River, where your guide will point out the history of the area. Before you depart from Jasper National Park, you can take part in an optional Spirit Island Cruise on Maligne Lake. You’ll then travel west along the Yellowhead Highway and into the heartland of British Columbia, where you’ll be greeted by breath-taking, unspoiled views of the landscape which remain spectacular through every season. The route takes you along the Thompson River and through the picturesque Shuswap Highlands. Today you’ll drive through ranch lands and dramatic scenery as you make your way towards the coastal mountains. You’ll witness new vistas at every turn as you journey along the Duffey Lake Road. 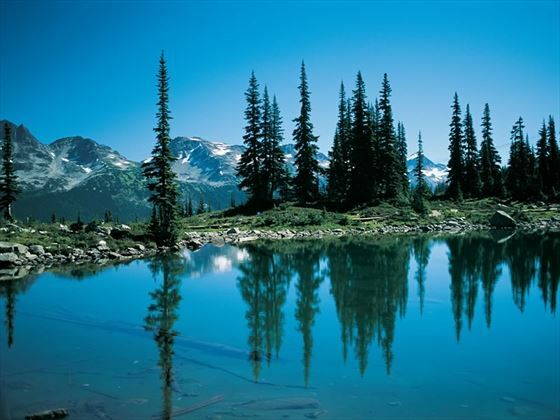 An optional Floatplane Sightseeing Tour over Garibaldi Park offers an inspiring view of the natural preserve of volcanic peaks, alpine lakes and lush meadows; alternatively, you can embark on an optional Tree Trek Canopy Walk through the treetops of Whistler on Blackcomb Mountains. Enjoy the rest of the day at leisure. The Sea-to-Sky Highway leads you south through amazing coastal scenery today; from Horseshoe Bay you’ll cruise by ferry across the Strait of Georgia to Vancouver Island and continue by coach to Victoria in British Columbia. Arriving in Victoria, you’ll take a city tour to get to know the sights. Victoria is a quaint and colonial destination with many 19th century landmarks dotted throughout the city. You’ll be treated to stunning floral displays at the world famous Butchart Gardens then you can take part in an optional Floatplane Sightseeing Tour over downtown Victoria and the Strait of Juan de Fuca, with the Olympic Mountains in the distance. You can also go on an optional whale-watching excursion aboard a Zodiac or regular vessel, where you can keep a lookout for magnificent orcas and marine life. The rest of the day is yours to spend at leisure, exploring the wonders of the city. Today you will continue to Vancouver via a pleasant cruise through the resort region of the Gulf Islands. Upon arrival, you’ll enjoy an interesting tour of the city, including Stanley Park, English Bay, Gastown, Chinatown and many more attractions. The rest of the day is free to explore on your own before heading to the Capilano Suspension Bridge for a farewell dinner in the evening. There will be time for some last-minute shopping and farewells before making your individual transfer to Vancouver International Airport in time to check in for your return flight.